The Chief Minister, who made an aerial survey of the three districts in the morning, set a 48-hour deadline for restoration of connectivity, power and water supply in all the affected parts. BHUBANESWAR: Chief Minister Naveen Patnaik on Saturday announced a special package for Ganjam, Gajapati and Rayagada, the worst hit districts in the cyclone Titli and subsequent floods, even as the State Government launched massive relief and restoration measures in the affected regions. The Chief Minister, who made an aerial survey of the three districts in the morning, set a 48-hour deadline for restoration of connectivity, power and water supply in all the affected parts. He announced that all affected families of Ganjam, Gajapati and Gunupur sub-division of Rayagada district will be given relief for 15 days. “On an average, a family of four members will be assisted with more than Rs 3000 as relief. This will be Rs 60 per adult and Rs 45 per child per day,” he told media persons here after reviewing the situation at the State Secretariat. “Electricity supply to 90 per cent of affected areas will be ensured in next 48 hours and the remaining 10 per cent areas in three to five days. Safe drinking water will be provided in all block areas within 48 hours. Besides, water supply will be restored in all urban areas in the next 24 hours and all tubewells will be made operational by Sunday,” he asserted. At least 16 persons are feared dead and 10 others missing in Gajapati district in cyclone Titli-induced rains that led to flash floods in South, Coastal and North Odisha districts, affecting over 46.48 lakh people. The Chief Minister said house and crop damage assessment will start once the immediate relief and restoration measures are completed. Responding to criticism from the opposition Congress and BJP on the Government’s failure to tackle the situation, he said, “The severity of the cyclone and its aftermath is next only to 1999 super cyclone. The Government is busy with relief and restoration measures.” He expressed grief over the death of 16 persons in the landslide at Baraghar in Gajapati district and said the Government will do everything to help the affected families. 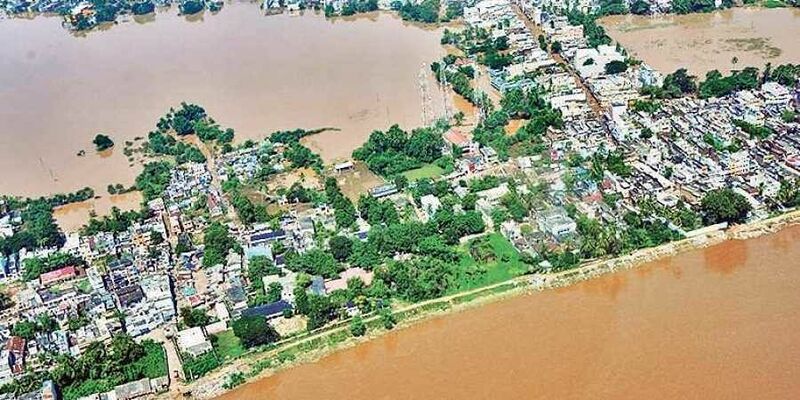 According to the office of the Special Relief Commissioner (SRC), 7103 villages under 111 blocks in Gajapati, Ganjam, Rayagada, Puri, Kandhamal, Kendrapada, Keonjhar, Cuttack, Dhenkanal, Khurda, Rayagada and Jagatsinghpur districts have been affected by the flood. As per preliminary estimates, 4,909 houses have been damaged in seven districts. The flash floods have damaged crops in 1,63,866 hectares while 7,21,670 livestock have been affected and 4,115 have died. While 3,49,297 persons were evacuated and sheltered in 1,495 relief centres, 1,32,643 persons were sheltered in 1033 relief centres on Saturday and provided cooked food. Chief Secretary Aditya Prasad Padhi said personnel of Indian Navy, NDRF, ODRAF and Odisha Fire Services are conducting relief and rescue operations while restoration work is on in war-footing. Two Navy helicopters have started air dropping of food packets and relief materials in worst affected Aska and Soroda in Ganjam district. While the situation has started improving in South Odisha with floodwater receding in Vansadhara and Rushikulya rivers at Gunupur and Purushottampur respectively, water level in Baitarani and Budhabalanga rivers is rising constantly giving rise to threat of flood in North Odisha districts.